Ooops! I had to change something. Read it again. Bubba spent a sleepless night in Stratton, Colorado listening to the mysterious chanting in the cornfields. He claimed they were chanting, “Bubba, Bubba” over and over. The next day, we woke up bright and early and continued our trip east. I still don’t know where they are heading, but we are in Kansas, moving fast. 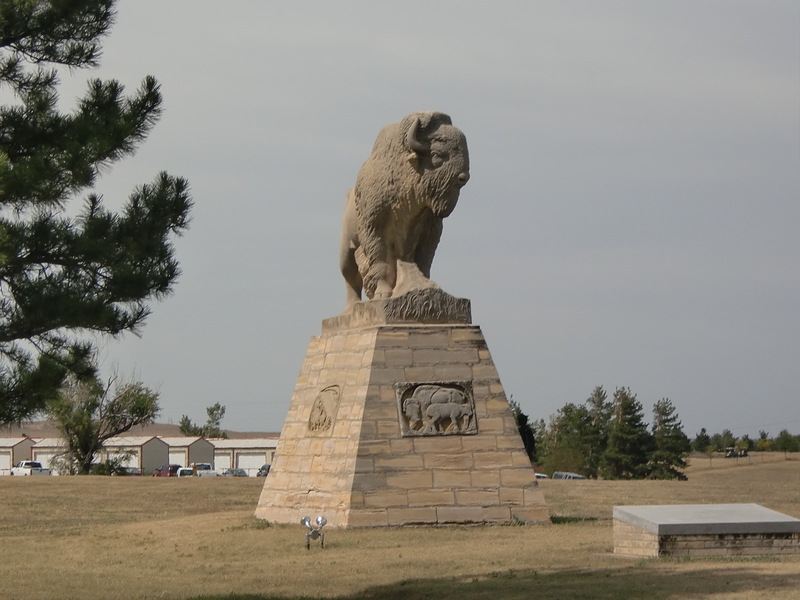 We stopped for a break at Fort Hayes, not far off the main highway. 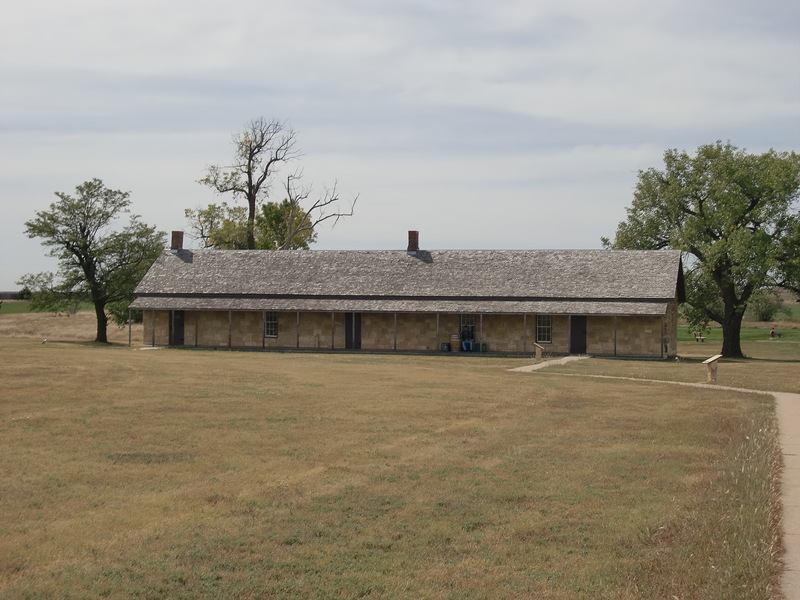 The visitors’ center said this was a fort that was established to keep the Indians in the area safe. I’m not sure how that turned out for the Indians, but they all were gone in a few short years and the fort was scaled down. 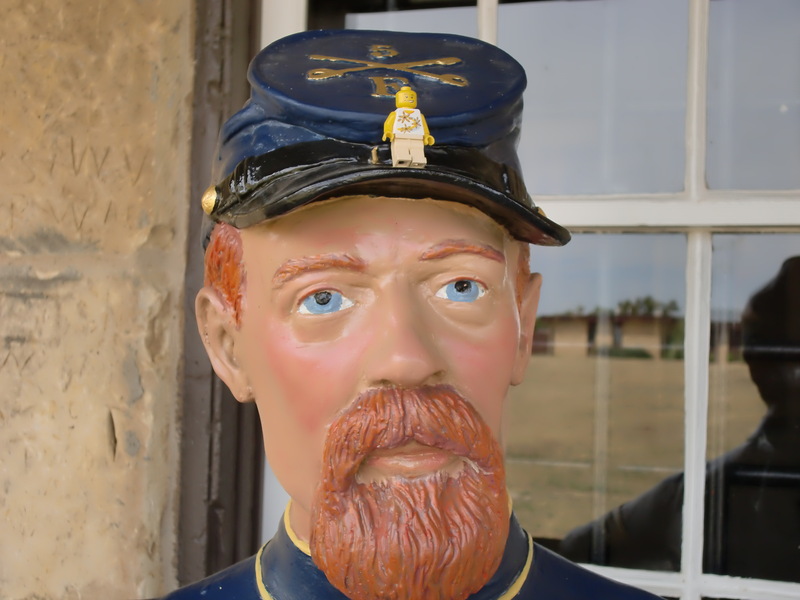 I saw an old guy in uniform sitting at the old guard house and decided to have a talk with him. I guess the proper term here is to say, I moseyed out to talk to him. I asked him where the main road went and he told me it headed all the way out yonder to Salina and from there to Missouri. I was afraid of that. I think Rick and Spider are taking me back to where they found me. I asked the guy for some help and he and I formulated a plan. I asked Rick and Spider if I could drive for awhile. They said if I could figure out a way to use the seatbelt I could drive. When we got back to the car, I jumped in the driver’s seat, hooked up a belt sort of type thing, and off we went. I hit the gas hard (with a big stick) and when we hit Salina, I made a giant right turn and headed towards Wichita before they knew what was happening. They had surprised looks on their faces but didn’t object. Part of that may have been because they both had a tight grip and Spider had her eyes closed. Rick said something about this being like Mr. Toad’s Wild Ride. I don’t know who this Toad guy is but he couldn’t drive faster than me. The wind was howling past the car, or at least I thought that’s what that sound was. Turns out it was a siren from the Kansas Highway Patrolman behind us. I thought I was in a high speed Christmas parade but I guess those colored lights on the car mean something else. He took a look in the car and hesitated. I think he was surprised that a short guy like me could be such a good driver. He suggested that Rick drive, and left a nice note for us. In his haste, part of his uniform fell off. He must have been in a hurry to get somewhere else. I decided that, at least in Kansas, Rick could drive. 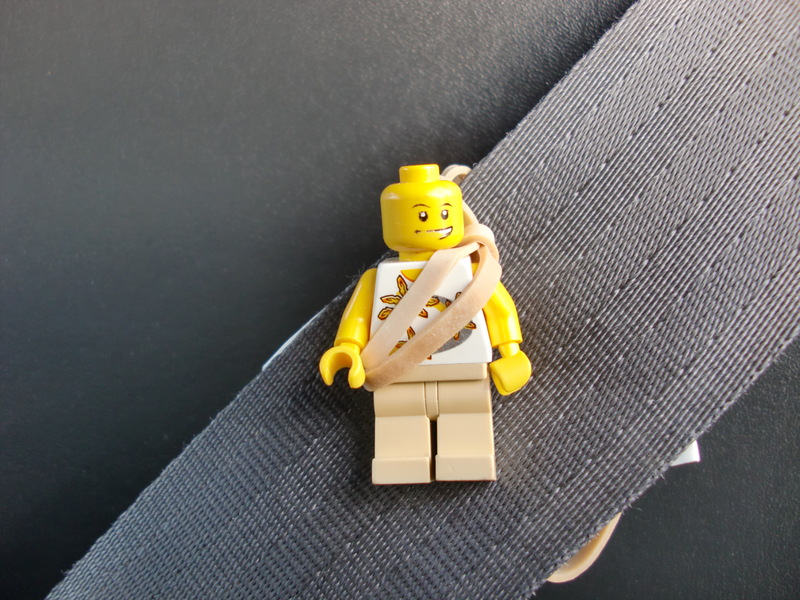 Bubba received his warning for speeding, using a rubber band for a seatbelt, and having a plastic license. Bubba’s turn in Salina put us on a southerly route, just what we wanted to do. We weren’t taking Bubba back to his old abode but I didn’t think I wanted to tell him where we were going just yet. 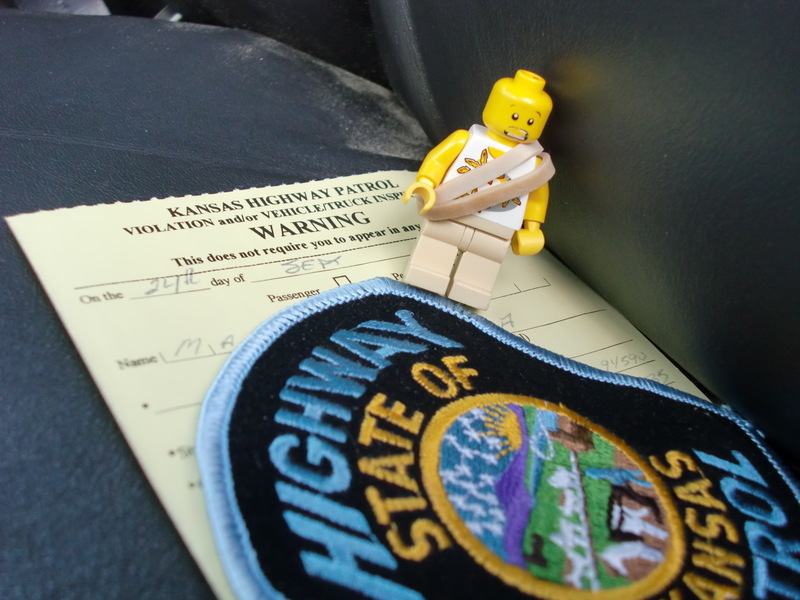 This entry was posted in Holiday, Humor, Kansas, Legos, Road Trip, Travel and tagged Bufflalo, Citation, Fort Hayes, Kansas highway Patrol, ticket. Bookmark the permalink.